The Charlotte Bobcats made a $250,000 donation to a Charlotte-Mecklenburg Schools (CMS) scholarship fund to help defray the costs of middle school athletics this academic year. The donation is the largest ever made by a professional sports franchise to CMS, and the largest single donation CMS has received to date in response to budget cuts that forced its board of education to implement sports-participation fees for all middle and high school student-athletes in the district. Basketball legend Michael Jordan, the Bobcats sports and entertainment chairman and CEO, says, "As an organization committed to bringing positive and lasting change to our community in the areas of education, fitness and youth development, we're compelled to help educators who are forced to make impossible decisions with their budgets by doing what we can to ensure every student-athlete has the opportunity to compete in school sports this year." BSE television-rights holder Fox Sports Carolinas is also participating in this initiative as a co-sponsor. Hopefully, other professional sports teams with access to billions of dollars will choose to invest in the athletic and academic programs of their local public school systems, especially since many players came out of public schools. 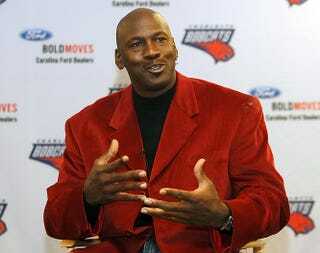 Definitely a good look, Mr. Jordan.